Once expected to lead her country but now an exile in her homeland, Nobel Peace Prize laureate Aung San Suu Kyi still harbours hope for a democratic Burma. As one of the first batch of ASEAN journalist to interview her since her release from house arrest, Ong Ju Lin writes her impressions meeting The Lady in Yangon. We were the first ASEAN journalists to interview Nobel Peace Prize Laureate Aung San Suu Kyi after she was released from house arrest in 1995. The clandestine meeting in Yangon was arranged by ALTSEAN –Burma (Alternative ASEAN on Burma), a Bangkok-based organization run by Malaysian Debbie Stothard which supports a democratic Myanmar (Burma). The pro-democratic Burmese movement continues to call the country Burma and its capital Rangoon although the military regime has changed their names to Myanmar and Yangon. That decision is a stance to reject the repressive one-party rule of the junta which did not have the democratic support of the majority of the people. Malaysia, as the strongest advocate of Myanmar’s entry into ASEAN, takes an ambivalent stance on the democratic movement in Myanmar headed by Aung San Suu Kyi. Malaysia’s mainstream media is wont to portray Suu Kyi as an obstacle in Myanmar’s government to unite and develop the country. Her party, the National League of Democracy, which won a landslide victory in the 1990 elections, is recast as the opposition party, and the ruling junta which refused to hand over power, as the legitimate government of Myanmar. With this political background in mind, it was with some degree of risks that I, as a Malaysian journalist and three other South East Asian journalists undertook the “unauthorized” journey to interview Aung San Suu Kyi. Entering the country as “tourists”, we paid a “social visit” to NLD deputy chairman U Tin Oo. The Lady, as Suu Kyi was fondly referred to, made her way to Tin Oo’s house as if a normal weekday morning meeting with the party deputy chairman. She was flanked by two bodyguards on the back seat of a white sedan car. That way, we avoided having to go through the security checkpoint at the roadblock leading to her house in University Avenue. Although, she has been “unconditionally released” as flaunted by the military government, visitors to her house still needed clearance from the authorities. After the interview, we found ourselves trailed by MI’s (Military Intelligence personal, akin to Special Branch in Malaysia) on motorcycles with cameras pointing at us. To shake them off, Stothard advised that we enter five-star hotels, changed into longhi (local sarongs), wear sandals and exit through the backdoor. This I did, and soon I blended in among the market crowd. At night, I went to pray at Shwedagon Pagoda, the temple where she addressed half a million people in a rally in 1988. As I kneeled down to pray in front of the statue of the Buddha, tears welled up my eyes thinking about my experience meeting her in the morning. The authour and Aung San Suu Kyi, 1997. 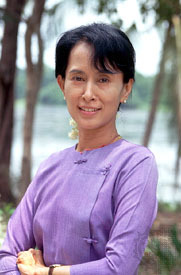 Aung San Suu Kyi has been made larger than life. Her charisma and courage under fire has been reported by the international media and her image has been broadcasted throughout the world, made into postcards and posters that were blown up to superhuman sizes. For her supporters, she is an icon, a beacon of hope. Yet, there is little known about her, as a person. Her detractors paint her as an agent of the West. In Malaysia’s mainstream media, Suu Kyi is seen as a controversial figure, a thorn in the military government’s effort to rule the country. Her party, the National League of Democracy, which received the mandate of the people in the 1990 election, has been recasted as an opposition party. But that morning, as I sat talking to her for an hour in U Tin Oo’s terrace house, all these images receded into the background. In front of me was a woman, who obviously missed her sons and the comforts of a normal life. That fact, that she was human, a mother, a wife, a person in her own right, and not just an icon or a beacon of hope for mere mortals like us, made her struggle all the more poignant. She had flowers in her hair. Small, white jasmine flowers that gave off a gentle sweet scent. She was small, shorter than my average height of 164cm. She spoke with a polished English accent, a product of being an Oxford graduate. She seemed guarded during the interview. Perhaps she was cautious speaking to ASEAN journalists, rightly so as our governments, which never did boast of good human rights records, have accepted Myanmar’s illegitimate government into the brotherhood of the ASEAN grouping. I appreciated her straight forward answers. When she had completed her no-frills, no-nonsense reply, there was a definite full-stop to it. Her answers were almost like well-rehearsed mini speeches. But she gently deflected personal questions about herself and instead pointed to the shared struggles of her fellow political prisoners. During her six-year house arrest, Nobel Peace Prize Laureate Aung San Suu Kyi was told by her captors she could leave the country at any time she wanted, on condition that she would never come back. She agreed, but gave her own condition: that she be allowed to walk to the airport several miles from her home. 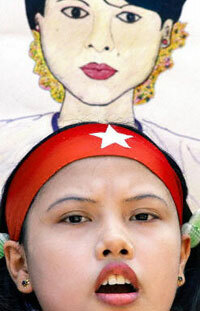 The military government refused, fearing that people would rally to her in her symbolic farewell. Such is the charisma of the daughter of martyred statesman, the much loved and revered Aung San who is known as the Architect of Burma. Following the footsteps of her father, Suu Kyi’s courage in standing against the repressive military junta won her admiration and support from her fellowmen. In the 1990 elections, two years after the mass slaughter of pro-democracy demonstrators in Yangon (Rangoon), her party, the National League of Democracy, won 82% of the seats contested. The junta refused to transfer power, and instead, launched a systematic crackdown on the pro-democratic movement, incarcerating party leaders, activists and students. After a six-year house arrest, Aung San Suu Kyi was released in 1995 but is still under constant surveillance. Her integrity, her love of her people, her personal policy of never sacrificing any lives for an assumed larger good in the face of violent threats, won her the Nobel Peace Prize in 1991. Last year, Myanmar was accepted as part of ASEAN in its policy of “constructive engagement” amidst controversies over human rights abuses that continue to plague the country. In an attempt to right its image, the ruling military has changed its name from the State Law and Order Restoration Council (SLORC) to the State Peace and Development Council (SPDC). Real changes, however, remain to be seen. Last December, three South East Asian journalists and I made our way into Yangon to meet The Lady in a clandestine meeting arranged by the ALTSEAN (Alternative ASEAN on Burma), a Bangkok-based organization working toward a democratic Burma. In the three-hour long interview, she spoke with poise and candour about the social-political situation in the country, about ASEAN, democracy and human rights. The following contain extracts from my interview with her in Yangon. The ruling military government has recently made some changes, for instance changing to a more benign image and removing some party leaders. What do you think of these changes? We’ve got to wait to find out whether there are going to be any real changes in policies towards democracy. That will be the real measure of change. Obviously, there is some change in personnel’s but whether it is a matter of sorting out who is more powerful or to determine who is going to adopt a more reasonable attitude, that we cannot tell. It could mean they are trying to bring in new blood or it could be they are delegating power, so that a greater number of their people in the arms forces are involved in running the country. You have repeatedly called for sanctions against the military regime. Don’t you think sanctions will hurt the economy and the people? I do not think that the economy will get any worse with economic sanctions, in the sense that the public do not suffer because the profits from economic projects essentially go to the top. The NLD as you know supports economic sanctions because it is aimed at bringing about a better record of human rights and democracy in Burma. Sanctions would hurt the elites, but they are the ones who could afford it. They can reduce their fleet of cars from six to five. I don’t think it will significantly hurt them too much. You have called for political changes in Burma. Must political change precede economic change? You cannot really separate the political and economic framework. Without the right political framework, a healthy economic framework cannot exist. For example, two of the most criteria for a healthy economy are free competition and the rule of law. Free competition ensures that the most able are give the opportunity to do all they can. Rule of law ensures not only equality, but so that people know that there are rules on what people are allowed or not allowed to do. When there is no rule of law, the economy turns into a chaotic situation. In this country, trade is so influenced by politics. There needs to be transparency and accountability from the government. It is so lacking that the country does not even have a reliable set of statistics on which to base any kind of economic predictions. As a new member of Asean, what do you think of Asean’s constructive engagement policy towards Myanmar? Asean was initially set up for political reasons to keep communism at bay, and now Asean is not at all interested in the political aspects of what’s going on in the region. The main concern of Asean appears to be solely economic concerns and everything else is considered the internal affairs of the country. We find that a little disturbing as I have said earlier, you cannot divorce politics from economics, because eventually politics will affect the economy. As the newest member of Asean, do you think Myanmar would be an asset to Asean? We do not think that Burma under the military will be an asset to Asean. When you think of a membership of a country you don’t just accept just the government, you accept the people. I think these are important questions to ask – are you adhering to the wishes of the government or are you respecting the wishes of the people? In the interest of the whole region, I don’t think there will be political stability in the region without fundamental political changes in Burma and without political stability, there can be no sustainable economic growth. And without that, Burma will be a weak spot in Asean. You have been painted as being rigid and an obstacle to Myanmar and Asean’s wish to unify and develop the region. Why do you think that is? I think that is how I am represented because many Asean governments have close relationship with the military regime. By rigidity simply means we are not prepared to let them oppress us and decide for us. Afterall we are the legitimate government that received the mandate of the people as is shown by the 1990 election. And we have been given the mandate to bring democracy to Burma. Therefore we have a duty to the people. Because we stand firmly by our duty to struggle for democracy, the military regime tried to paint us as being rigid. It has been said by Asian leaders that the Declaration of Human Rights does not reflect the values or situation of the people in Asia. What is your comment? That is not something that was said at the time when the Declaration of Human Rights was brought up. In those days, there were quite a number of Asian and African countries fighting for independence and they were demanding for equal treatment and the rights enjoyed by the western nations. Now that they have come around, they are saying that these values are not Asian and that Asians don’t need human rights. So, we have to be very careful about that. Burma was one of the original signatories of the declaration. I am not aware of any Burmese who stood up to say that it was not Asian or Burmese. If we were to accept values that originate only in our region, then well, there can’t be any Muslims in Malaysia because Islam did not originate in Malaysia, nor can there be any Christians around the way except in the middle east. If SPDC agrees to a dialogue with you and the dialogue leads to the possibility of working with SPDC, would it be agreeable to you? Of course we are very willing to join them to solve the problems of the country, that is why we have always asked for genuine political dialogue. In July they invited us to have a dialogue, but it was not a dialogue and SLORC (SPDC) made no doubts about that. It was simply a meeting. And there was simply not enough time. The second time around they invited Kyi Maung, NLD chairman. We did not respond because it is the policy of the party that he and I should always do things together, mainly because we were aware by separating the two of us the NLD could be split. We don’t want a sham dialogue. Genuine political dialogue requires equality, mutual respect – which means each side would choose who to represent them. If one party has the power to choose who too speak to in another party, how can you say that it is a genuine political dialogue? It is said that Myanmar’s problems cannot be solved unless the ethnic problems were solved. In your attempt to dialogue with SPDC do you also support a triapartite dialogue which includes the ethnic minorities? Of course we support that process. I think that a dialogue beginning with the military regime and the democratic forces is a very good prospect for tripartite dialogues. At the moment, a lot of the ethnic nationalities are afraid to get in touch with the NLD because they have been threatened and intimidated by the authorities. SPDC says that democracy can be in Myanmar without Aung San Suu Kyi. What is your comment on this statement? Well I would be very happy if there would be democratization in Burma without me because that would mean there is less of a burden on my shoulders. There have been criticisms of NLD that if it were to form a government, it will not make a viable government because it has no experience ruling a country. Did SLORC (SPDC) have any experience when it came into power nine years ago? Even for the government in Britain, most of the cabinet ministers are Labour party members who have no experience of governing a country because the previous Conservatives were in power for such a long time. So I don’t think you can use that kind of excuse. If you are going to take the attitude that only those with experience can rule, that means the government will go on forever. Since your release, how much freedom do you have? I am not even allowed to go for a meeting in Rangoon, for instance the youth meetings a few months ago. All this talk about unconditional release is a lot of nonsense. How can you call it unconditional release if the street to my house is blocked off and anybody who wants to visit me must get clearance from the authorities? It should not have been lauded as unconditional release. How do you feel that you have not seen your family for such a long time? My youngest son was allowed to visit me towards the end of September. But it is not for me to say how I feel. A lot of my colleagues are in the same boat. Husbands, wives, mothers are in prison and the children are not allowed to see them. Recently three elected MPs were arrested. They were neither allowed access to family nor counsels. They have the right to be defended by counsels but what has been happening is totally against the laws of the land. What is your impression of Malaysia? Of course we are very impressed by what Malaysia has achieved in the last 40 years. But the achievements of Malaysia are also for us a matter of sadness, because it reminded us that at one time were at a far more progressive stage than Malaysia, but because of the fact that our democracy was stunted, we lost out economically. Why have you sacrificed so much to remain in your political struggles? I don’t particularly call it a sacrifice. It’s a choice. One makes a choice. And it’s always a mistake to call it a choice because when you start calling something a sacrifice, it carries a certain implication that you have given up something. And I really don’t see why it should. It is something you do out of your own freedom. As Buddhists, we believe in Karma. Essentially what you reap is what you sow. That means if I choose to remain in Burma, it is my own choice and I bear the consequences of my choice. What is your vision of Burma? When I talk about liberal democracy I mean a political system where there would be regular elections, where the people are in position to freely change the government if they feel it is no longer acting for their benefit. I would like democracy to mean a country that is strong enough, liberal enough, and sensible enough to cope with crisis without undue harm to the people. The most important is to exercise our right to function as a legitimate political party. We are a legitimate political party. At the moment we are so restricted. We are not allowed to publish anything, not allowed to hold meetings, to recruit new members, we’re not even allowed to reorganize ourselves. They’ve tried to close down our offices, they’ve threatened our landlords. If we try to move then they would go and threaten potential landlords. Therefore our short term goal is to function as effectively as a political party despite all the restrictions imposed on us. Our long term goal is of course to practice liberal democracy. You are perceived as a global human model. What advice can you give? If you are going to perceive me as a global human model, than I have no advice to give you because I don’t like to be considered as that. The only thing I can say is that I would like to be seen as an ordinary human being caught up in extraordinary events. Do you desire to be the Prime Minister of Burma? That’s not my greatest ambition. My greatest ambition will be a peaceful old age. I hope that democracy will be well established in Burma before I am old so that I can enjoy my old age in peace. I am confident that there will be a democratic government in the not so distant future and NLD will play and important role. But I am also aware of many political parties which have worked for democracy for but many have been deregistered. I want to take this opportunity to express my appreciation to their efforts. It demonstrates their commitment to democracy and their generosity of spirit. Although they are not able to move as legitimate parties anymore, they are supportive of us because they know we are all working towards the same goal. This interview was published in the Sun Megazine, February 5, 1998 under the title All is Not Lost. hey speaking of free things try pulitzer prizeblingo, its free to sign up and you can win free prizes! I just won a free movie ticket! Ooou.. Ju, you looked so cute in here!